The NEWEST addition to our AstroPaq® Line introduces a fun eye-catching style, while delivering the function and durability you’ve come to expect from our wine pouches. The AstroPaq® 1.5L Barrel Bag holds the equivalent of two 750ml glass bottles of wine. Durable, convenient and eco-friendly, this is the perfect opportunity to dominate the 1.5L glass market with our stylish packaging. Why AstroPaq® 1.5L Barrel Bag? High quality labeling solutions for barrel bag branding applications. 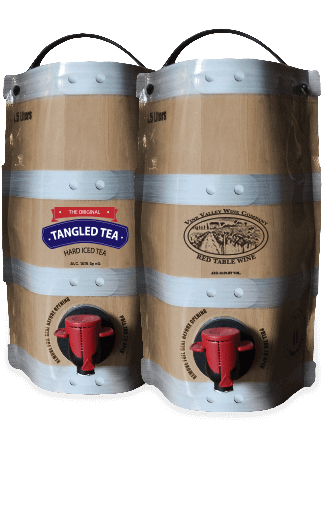 Our barrel bag designed labels will compliment your existing packaging by providing a high impact, economical solution for short run opportunities. New to AstroPaq®? Start Here! The AstroPaq® 1.5L Starter Kit contains everything you need to get up and running. Gas injection device that uses inert gas to gently puff open the AstroPaq® 1.5 pouch; allows for easy manual filling using the filling stand. Cost-effective tabletop filler with nitrogen/ vacuum purge. © 1999-2019 Vine Valley Ventures LLC - All descriptions and specifications subject to change without notice.